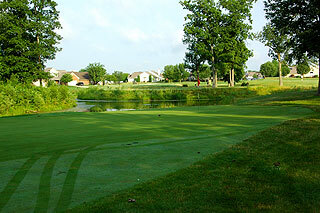 Heartland Crossing Golf Links is a collaboration of Nick Faldo and Steve Smyers that has come to be recognized as one of the top golf courses in the Indianapolis area. With mildly undulating terrain and wide open spaces, the region is known for its high quality links style layouts - and Heartland Crossings is certainly one of them. 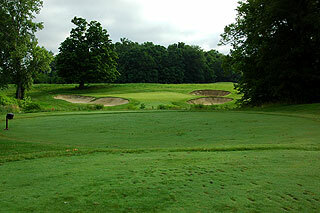 Immediately, golfers will notice that this course is laced with spectacular bunkering, a characteristic so vivid that it separates this course from all others. In all 80 sand traps line the fairways or are situated greenside, but the scope of these hazards make the total seem understated. There is a great variety in size and shape, including those with sweeping, intricate designs that are laced with fescue rough. Land in some of the deep high lipped traps and recoveries for par can be difficult. 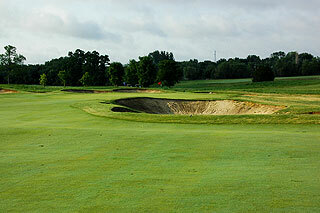 Marines would find ample protection on number 17, on an upward climb through a maze of deep craggly sand bunkers! Generally, the landing areas are usually ample enough that these hazards can be avoided, but accuracy and distance are necessary to score well here. 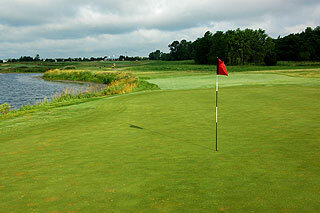 Water comes into play on just four holes, including the beautiful par three pictured above. 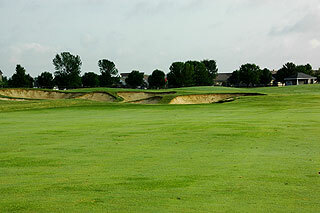 Sand dominates the undulating terrain which features finely manicured fairways that provide mostly even lies. Colorful high grasses are present near the tee areas and along the perimeters of many holes, providing additional incentive to land on the fairways. The greens of various shapes and sizes are mild in slope, and roll quick and true. Land in regulation and birdies can be had. Distance is certainly a necessary commodity, especially for those playing from the tips which play to 7267 yards with a slope of 134. Alternate sets afford golfers of all skill levels to choose a set that matches their game, with distances and slopes measuring 6849 yards/130 slope, 6406 yards/126 slope, 5976 yards/121 slope and 5536 yards with a 121 slope for women. Pro Link GPS is standard on all carts providing accurate info from tee to green, and pin placements are also indicated on the scorecards. Permanent yardage markers are posted on the cart paths and sprinkler heads on the fairways are also measured to the center of the green. 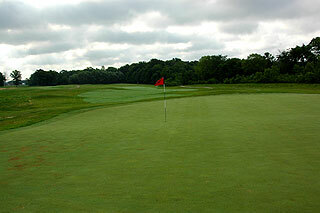 The practice facilities are extensive, with a grass range, short game area with sand bunker, plus large putting green. Range balls are staked in pyramids on the range, and are complimentary! The Premier Golf Academy is on property, providing individual and group lessons plus golf schools of various intensities. 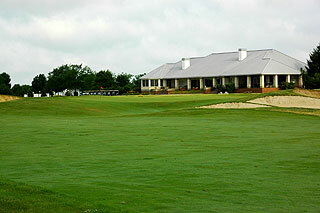 The clubhouse features a nice pro shop, locker rooms with showers, plus a snack bar area serving hot and cold sandwiches. Meeting and banquet facilities are also part of the complex. 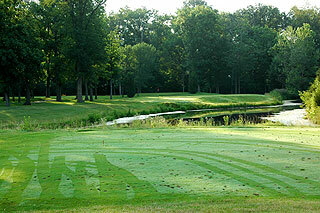 Heartland Crossing participates in the MAX prime time player's card program, which includes some of the area's top courses (Prairie View, Purgatory, The Fort, Bear Slide and Legends of Indiana). For more info, visit our page for Heartland Crossing, with direct link to their website by clicking here.